Click on Thumbnail for MapWandering along the Trace, still, past Learned and on our way to the Mississippi River. Check out the map by clicking the thumbnail at right, and leave a comment with your comments on racism or whatever else you think important. "I went to the Trace again, following it through pastures and pecan groves and tilled fields; wildflowers and clover pressed in close, and from trees, long purple drupes of wisteria hung like grape clusters; in one pond a colony of muskrats. 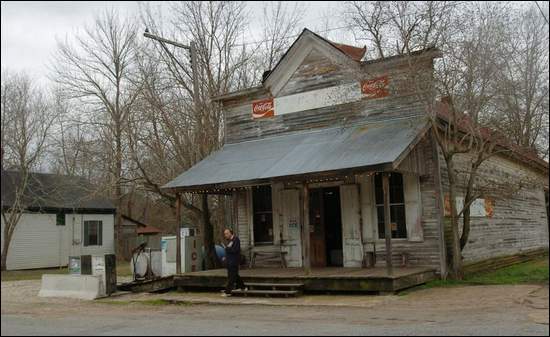 I turned off near Learned... "
Old country store in Learned, Mississippi. Click on image to go to host site. Learned, Mississippi is a place where I'd like to think about the nature that LHM describes. But unfortunately, it is also a place which houses a relic of Mississippi's racist past. The Nationalist Movement (note: by linking to the Nationalism Movement website, I am not indicating any sympathy or agreement with their position), is located there. The Movement was until recently run by an attorney named named Richard Barrett, who was stabbed to death in April 2010 by a black man who accused him of making sexual advances and who now faces the death penalty. This makes the juxtaposition of the beauty of the Natchez Trace described by LHM, and the ugliness of Mississippi's violent racist history, a bit uncomfortable. I suppose I could have grown up a racist, because I lived in a town that was once a bit more intolerant than it is now, like a lot of places. My town had various cultural groups, including Italians, Portuguese, Finns, Irish and some Mexicans when I was growing up. These were not the usual groups you associate with racism, but the feelings expressed were often that way. Portuguese families were called "Portagees." Italians were often made fun of - I have an Italian uncle who even made fun of his own ethnic heritage. There were sections of town where you could find a predominance of one culture over another. I didn't see black people regularly until we got cable TV and started getting the Bay Area television stations. I think that was when I was eight or nine. We only had one black person that I knew of in town when I was growing up, a young girl who would come stay with her white grandparents down the lane and across the road from where I lived. Later, when I was in high school, a young black woman moved into town, and I watched as all my white male high school classmates fell all over themselves to impress her because she was, I guess, exotic and interesting. I must say that I feel my town is more tolerant and accepting now, but even today, as more Mexicans move up through California, some illegal working and then going back home, others legal and making their lives in my town, I still hear some racist sentiments. I cringe when I hear my mom say some less-than-flattering things about Mexicans, and gently scold her (she's 79 and probably won't change too much). Give us your food; your salsas, tacos and enchiladas. But don't be too visible, because we'll fear and hate you. But I always had liberal tendencies and thought that people were people, regardless of their skin color. When I was in college, I had a friend who was very definitely racist, and I put up with him and even enabled him sometimes rather than fight him until after college I went to volunteer in the inner city. He called me one night, very intoxicated, and began spouting racist remarks to get a rise out of me. After working with economically disadvantaged black children in an inner-city Catholic school and having my heart wrung out every day with their stories, I wasn't so forgiving of his views and we didn't talk again for many, many years. I have recently been rewarded by knowing that I have some African-American blood running through me. Two years ago I learned about my biological mother and her family, which was from West Virginia, and the fact that this family most likely has some mixed blood. The last name of my biological mother was enough to mean that her family was one of a half dozen or so that were victims of prejudice for being less than white. While many members of my biological mother's family want to downplay or deny this connection, others, especially younger ones like myself, are okay. When I found out that I might be of mixed race, I was happy. I felt like I suddenly went from being boring to interesting, ethnicity-wise! So, I take a dim view of people like Richard Barrett and movements like the Nationalist Movement. I respect people's right to free speech, but their speech calls for an America that is long past. It calls for an America divided on ethnic lines, where groups of people through no fault other than the color of their skin or their ethnic heritage sit in either a privileged or marginalized place. It denies certain ethnicities the opportunity or the possibility to participate in the building of America. It is wrong, and it is fast becoming irrelevant as America becomes more diverse, and whites become a majority minority, outnumbered by blacks, Hispanics and Asians in combination. This speech is the speech of fear, and rather than fearing my fellow Americans, I choose to embrace them, call them brother and sister, and work with them to keep America a vital and free country. There's not much on Learned, and there's a lot on Richard Barrett since he was murdered. Here's what little information I could get about Learned and a couple of things about the murder. At least Learned sits along the Natchez Trace, which looks beautiful!